Economic turmoil has always gone hand in hand with social unrest. The new Great Global Depression we are currently experiencing has been no exception (let’s call it what it is). While the news media gravitates toward the spectacular scenes of riots and violence that emerge from Greece, a country that has been pushed to the brink through a toxic combination of ideological blindness, economic lunacy, corruption, greed, coercion and incompetence on the part of political and economic elites, both foreign and domestic, who are keen to pursue their own particular agendas at the expense of ordinary people, popular discontent is emerging elsewhere. Certainly it would appear that the very fabric of Greek society is unravelling as it spirals ever downwards; whatever happens in the grand macro-economic scheme the consequences of this trauma upon Greece will continue to haunt it for many decades to come. The cold economic statistics disguise the countless lives cut short or lost through health problems, heart attacks and suicide caused by the sudden shock of having your life ripped apart, not to mention the stunted prospects and aspirations of ordinary people left without hope and trapped in a situation of mere survival. But challenges to the status quo have emerged more recently through the Occupy Movement which spread to many cities throughout the globe during 2011. However the two central encampments were located in New York and London, the homes of world finance where the foundations of the current global financial meltdown were laid down, and are the subject of the two publications discussed here. Grass-roots political activism is a terrifying prospect for established political elites who seek to frame issues and debates in such a way that they can control and potentially use for electoral gain. Professional politicians of all shades tend to be like leeches; they use their experience and the leadership positions they hold in order to latch on to a particular issue and bleed it dry of any meaningful significance (through either support or criticism; it matters not which) and turn it into pre-packaged sound-bites which they know our increasingly frenzied news media will leap on. This is just the way representative democracy works. However, the distinguishing feature of the Occupy Movement was that it had no central leadership, being a disparate group of individuals brought together by a shared sense of injustice about the various issues which they felt passionate about. This of course is both a source of strength and also of weakness; by having no centralised leadership structure it is very difficult for opponents to undermine such a group because there is no central point to focus their attacks upon. However, this structure is also inherently weak in that what you get is a confusing cacophony of various messages about a range of issues that will not impact upon the wider public. Capturing middle-class public opinion is the key in order for protest to create a momentum for change. But middle-class opinion is inherently conservative (they have mortgages to pay and families to feed) and tend to be attached to established political parties so this lack of a central message meant that it was easy for them to be swayed by arguments that presented protestors as cranks whose demands were unworthy of serious consideration. 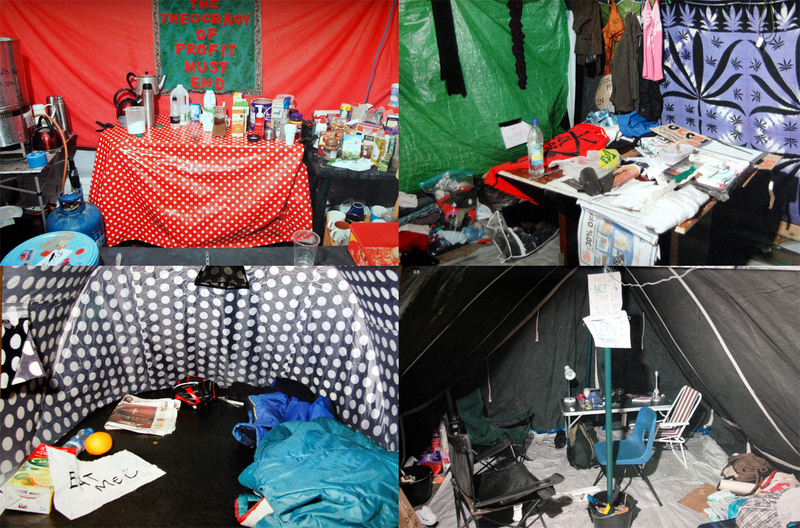 Looking at the first publication, Occupied Spaces by Ben Roberts, a 28 page book published by HERE Press bound in red cord, we are presented with a series of images documenting the interiors of the London tent encampment. 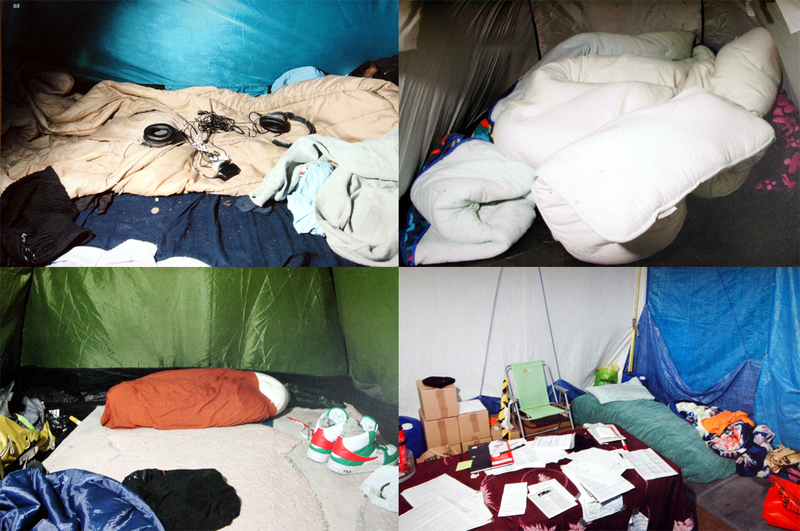 Beginning with the cramped interior of individual tents stuffed with personal possessions and sleeping bags before moving on to the larger, comparatively cavernous tents which have been established as canteens and educational spaces complete with sofas and pianos we are presented with images of something that is neither wholly temporary or permanent. Although individual protestors are absent from the images their presence is etched upon the very fabric of the personal possessions that are presented to us. Sleeping bags that have seen countless cold, wet and dreary nights, scrounged bits of furniture, battered guitars, cardboard boxes serving as tables and hand-made placards all serve to represent the determination and resilience of those who voluntarily chose to inhabit these uncomfortable spaces for so long. 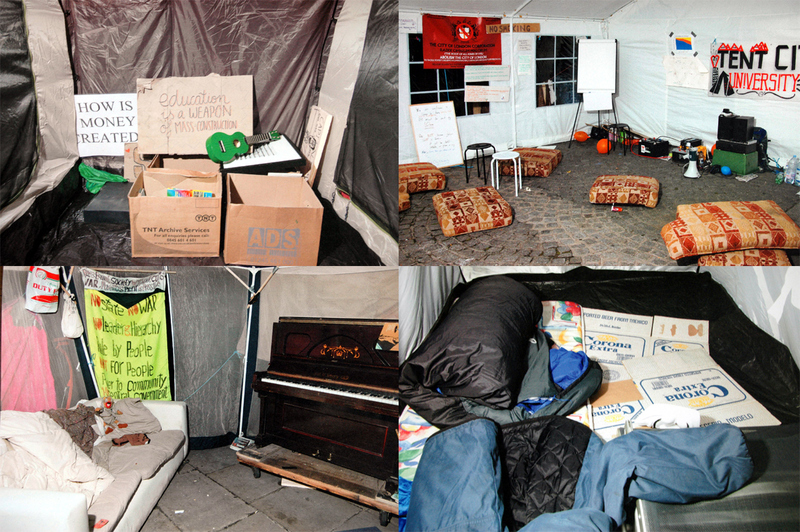 By camping out on the streets, the Occupy Movement was attempting to signal their sincerity and determination to press for change and ensure that the pressure would be kept up. However, one of the main arguments used by opponents of the protest in London was that the tents were mostly empty. This narrative served to attack the credibility of the protest and undermine the legitimacy of the issues they raised; it cast doubt upon the scale of the protest movement, questioned the commitment of the protestors who weren’t prepared to sleep overnight on the street and, most importantly, attempted to represent the protestors as engaging in active deception. In essence, the media message was what else are the protestors lying about? Instead of engaging with legitimate issues and concerns raised by the protest the media debate shifted to discussions surrounding the moral character of the protestors. Powerful people never have to justify themselves; protestors always have to be squeaky clean if they are to be credible. Fear of moral outrage is also the reason why the authorities usually attempt to clear such encampments in the dead of night (using the pretext of sanitation concerns or health and safety to legitimise their actions) and preferably keep their actions hidden from public scrutiny, which is exactly what happened in London. 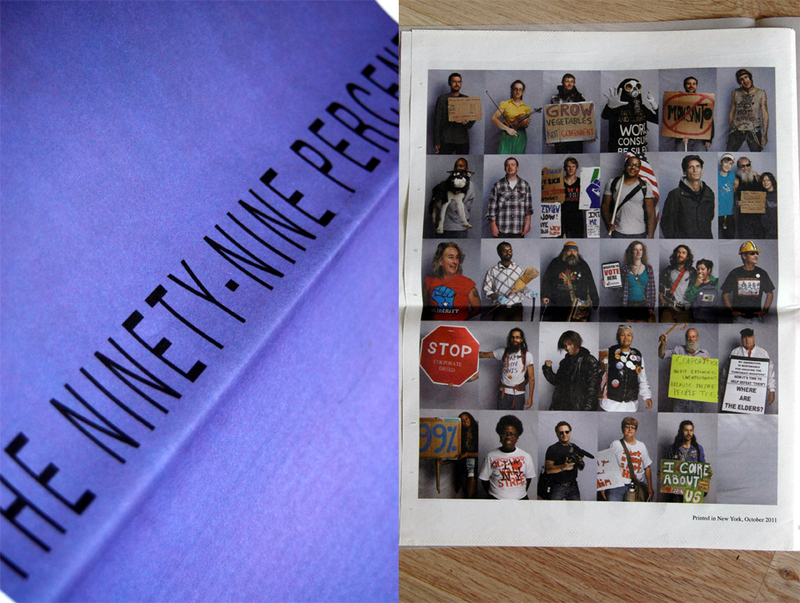 Turning to the second publication, The Ninety-Nine Percent by Mathieu Asselin, this work presents a series of individual portraits of protestors made in a temporary studio within New York’s Zuccotti Park, printed in the format of a newspaper with a print run of 1000 (900 were distributed free of charge on the streets of the city.) Using a newspaper format, for me, is significant; the traditional news media, in spite of the internet, are still perceived as more reliable in the public mind as a source of truth and their reporting of events forms the broad parameters of debate within which an issue is viewed by middle-class opinion. The photographer has clearly built up an engagement with each individual he photographs and this comes through in the final images which exhibit a vibrancy that can only be attained once a rapport has been established. 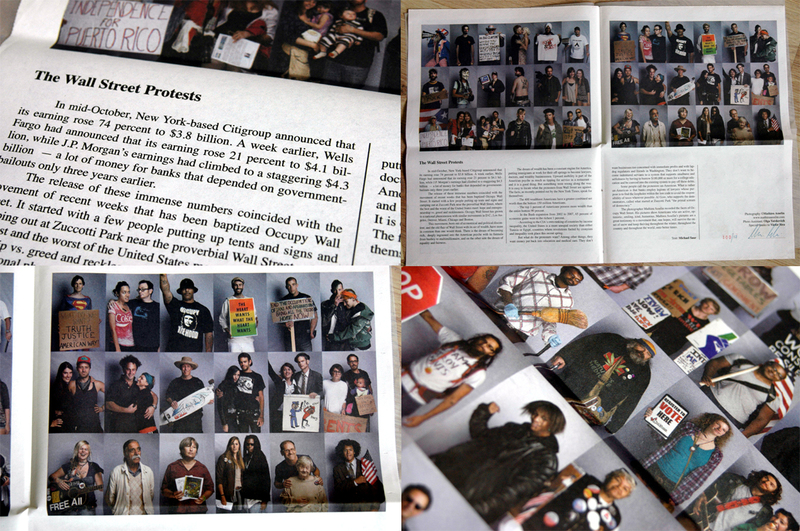 Presented in a grid format over three pages, the portraits serve to present a snap-shot in time of a spontaneous movement made up of courageous (committed protest takes courage) and idealistic individuals whose only weapon is moral outrage against injustice. Returning to my earlier comments, these images, in my opinion, also highlight one of the main weaknesses of the Occupy Movement; corporate greed, the ending of US military involvement abroad, environmental concerns, unemployment, voter registration, Wall Street fat cats, GM food, health-care, police brutality, Puerto Rican independence, Monsanto, Clinton’s repeal of the Glass-Steagall Act and Fox News are just some of the very legitimate and pressing issues raised by the protestors in these photographs. However, if public protest is to result in any movement on the part of political elites then it must reach middle-class opinion (who politicians ignore at their peril) and the lack of a single coherent message left the space open for media attacks which discredited the Occupy Movement in the eyes of this influential social group. The Occupy Movement because of its structure was always going to find it difficult to battle on equal terms with the vested corporate, financial and political groups who wield immense power within society. However the strength of a just argument presented by a sincere and committed individual or group with integrity is a great leveller. That is the reason why it is so feared. 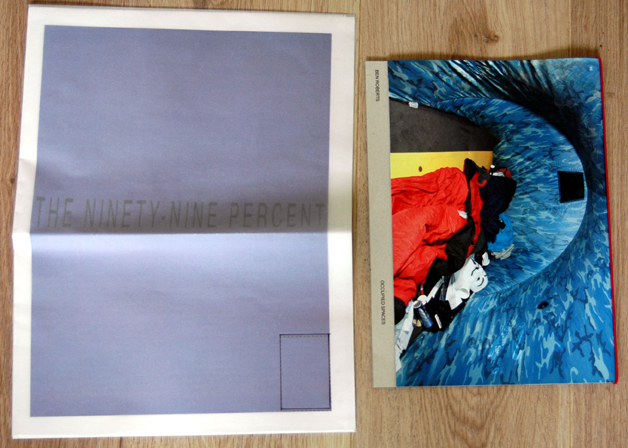 My brand new e.book further supports your view and what the 99 % movement is all about.